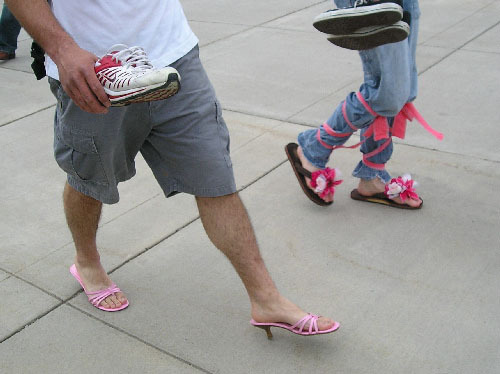 April 13, 2006 | Christopher Barron, a Utah State student, walked clumsily in pastel pink heels, his shoes clicking heavily on the pavement with each painful step. The cracked sidewalk caught him and he stumbled slightly, regaining his balance with a labored grunt and a small chuckle. "I don't see why girls put themselves through this pain," Barron said. "I look at my regular shoes and think, 'What a beautiful architectural design of comfort.'" 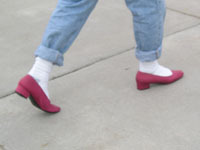 Barron, along with several other men, participated in Wednesday's walk-a-mile-in-her-shoes campaign as a show of support. The campaign focused on increasing knowledge of sexual assault at Utah State and was part of USU's Sexual Assault Awareness Week. As the walk continued, Barron veered of the concrete path onto the grass, where he said his feet were able to feel more comfortable. A friend rode by on his bike, and Barron waved and responded to the "how are you?" question by responding, "Not as good as you, you're on a bike! Barron said he wasn't given a choice as to what shoes he wore. He said he was hadned a pair, and when he put them on they felt too tight. He thought they didn't fit, but then realized they were supposed to be tight. As the end neared, the clicking became heavier and a silence among participants became evident. "It has become a sober walk now," Barron said with a laugh. "There is not much talking and laughing. The pain has kind of become secondary. My only goal now is to finish this." Participants crossed the finish line with cheers of support and encouraging music. Sighs of gratitude filled the patio as men traded in their heels for tennis shoes and sandals. "This feels like an answer to my prayers!" Barron said. Barron, along with other participants, said he felt the walk was a good experience and it increased knowledge of womanhood. "That was a mile of soul searching, and I've come to the realization that woman have unique qualities that men will never have -- no matter how hard they practice," Barron said.